Our Mountain Farm is waiting for you! Surrounded by meadows and woods and far away from the traffic you will find the tranquility to recover from the daily stress. Our recently built house with the apartment Laguscel, offers the best conditions for a relaxing and restful holiday. Nearby the breathtaking Natural Park Puez/Odles offers innumerable possibilities of walks and excursions…in summer and in wintertime! Family Clara is waiting for you! Our house is situated at 1545 m above the sea level, two km above the village Campill. It's the ideal place for a holiday in the middle of nature and you'll get insight into our farmers’ life. During your stay you'll have the possibility to do some trekking into the Natural Park Puez-Odles, part of the Unesco World Natural Heritage, and enjoy the fauna and the flora in the Dolomites. Start from our house to go around the Pütia mountain or to climb up to its top, where you'll be rewarded with an outstanding panoramic view. The peaceful Valley of Antersasc, the amazing high plateau Puez, the natural park Fanes-Sennes-Braies are some more places you should not miss! Discover the beautiful "Val di Morins": it's a lovely place with several restored water mills. You'll be set back into time when the farmers depended on them. 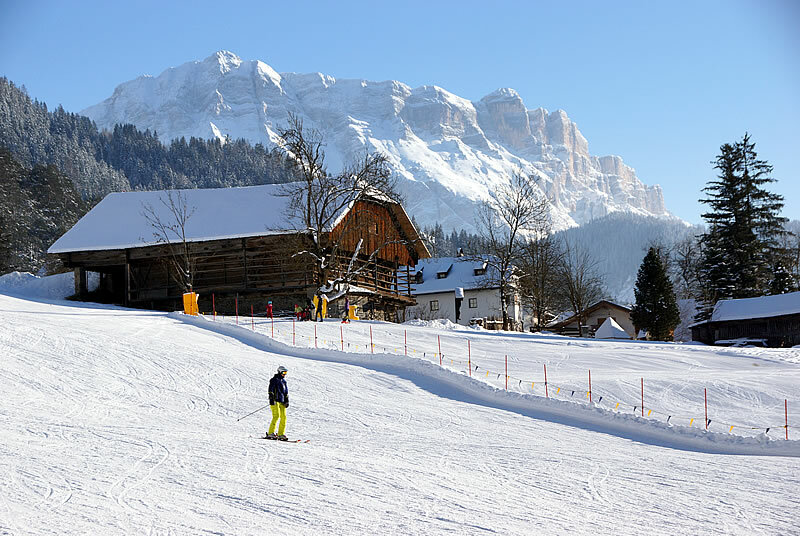 In winter you'll get in a couple of minutes to Kronplatz/Plan de Corones ski resort, known for its sunny plateau and long ski runs, or to Alta Badia with its unique Sellaronda, two of the 12 different ski areas of Dolomiti Superski. 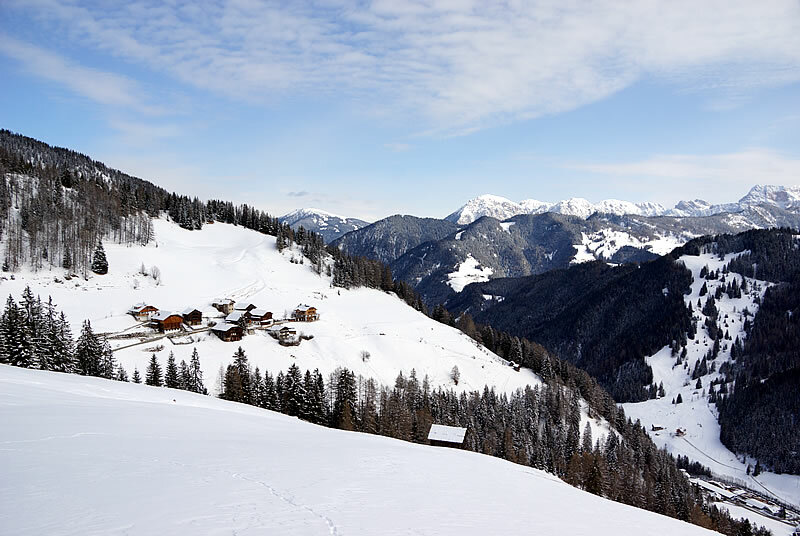 Non-skiers will find a lot of activities for their winter holiday: ski touring, snowshoeing or winter walking. In the apartment you'll find whatever you need to feel like at home. Our fully furnished apartment (56 m²) consists of a kitchen-living room with a sofa bed, a spacious bedroom with a double bed and a single bed, a bathroom with shower and bidet and a south facing balcony. There's free WiFi internet access. You'll find the following equipment: coffee machine, dishwasher, fridge with freezer, electric cooking plate, water boiler, microwave oven, toaster, cutlery, flatware, pots, vacuum cleaner, TV, hair dryer, washing machine, towels and bedclothes. We can provide whatever you need for your kid: high chair, child's bed, bath tub, carry bag for your trekkings. 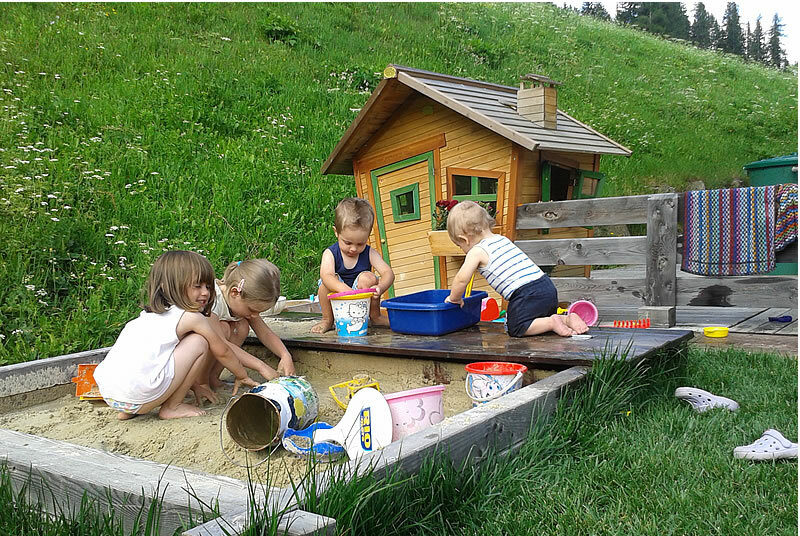 There's a small playground with a swing, a slide, a sand pit, a small wooden house and a tricycle. In winter you can have a lot of fun sliding with the snow disc or building a snowman. In the apartment you’ll also find some games and books. You'll enjoy to stroke our animals! There are cows, calves, chickens, quails, cats and rabbits living on our farm. In the evening you can feed them in the stable. No animals allowed in the apartment! We offer breadservice, pick-up service, herbs and vegetables from our garden. The rates are intended for a stay of at least three days and include weekly linen change, electricity, heating and final cleaning. For a stay less than 3 days the price increases by 5€ per person a day. The listed prices do not include the mandatory "Tourist Tax" required by law about 1,35€ per person and night (aged 14 and over), payable upon departure (Law nr. 9 from 16.05.2012). Arrival and departure day is Saturday. Different arrival and departure days are possible only on request and if available. The apartments are available from 2 p.m. and must be checked out before 09.30 a.m. In case of cancellation of the reservation up to 30 days before of arrival, the deposit will be returned. In case of cancellation after this date, the deposit will be retained. We do not accept bancomat or credit cards. Please pay in cash, cheque or advance bank transfer. In case of late arrivals and/or anticipated departures you will be charged the total rate of the reservation. Please contact us in advance if you will check in after 7 p.m. and if the number of the people booked changes.